Besnik Hasi was struggling to come to terms with Anderlecht’s 2-1 defeat to Arsenal, having conceded two last-gasp goals on Wednesday. 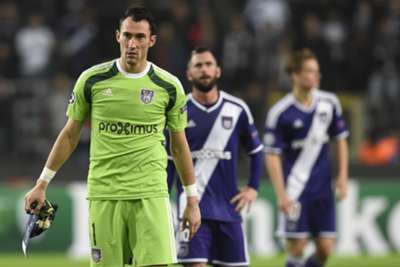 Anderlecht were on track for a memorable UEFA Champions League win when Andy Najar headed home from close range in the 71st minute at Constant Vanden Stock Stadium. But just as Anderlecht fans prepared to celebrate in Brussels, Kieran Gibbs and Lukas Podolski both scored at the death to give Arsenal an unlikely victory in Group D.
Hasi, whose team has only collected one point from their three matches, said Anderlecht deserved all three points against the Premier League giants. “The disappointment is great. If we had lost to a better team, I would be there to lay me down. Such is not the case today,” Hasi said afterwards. “The first half we did well but there were on both sides no chances. After the break we opted for the counter-attack and that paid off. “We scored at a perfect time. We had the game just to play. This is so unfortunate. “I’m very proud of my boys, because they have shown a lot of quality.